Opera for Windows, Mac and Linux gets Power saving mode in latest update. Opera for computers has become the first major browser to feature a power saving mode - out today in the developer stream. The new mode extends the laptop battery life by up to 50% compared to earlier versions of the Opera browser and to Google Chrome. Using the new power saving mode is easy. Once the laptop's power cable is unplugged, the battery icon will appear next to the search and address field in the Opera browser. Click the battery icon to activate the power saving mode and flip on the switch. The browser will also detect when the laptop's battery is running low and will suggest enabling power saving mode. 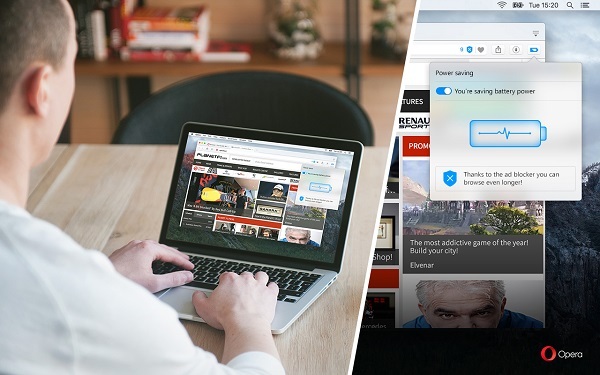 In Opera's test, designed to reflect the way people use browsers in real life, the latest Opera developer version was able to run 3 hours longer than browsers like Google Chrome on a laptop running Windows 10, 64-bit. These results are from the test we have done on 11 popular websites. For testing we used the Selenium WebDriver. Each page was opened in separate tab, without closing previous ones, and was scrolled 5 times, then left alone for a minute. The test was repeated until the laptop ran out of battery completely. While testing the battery life with the power saving mode enabled, the ad blocker was on, too. The machine was Lenovo X250, Core i7-5600U, 16GB RAM running on Windows 10, 64-bit.